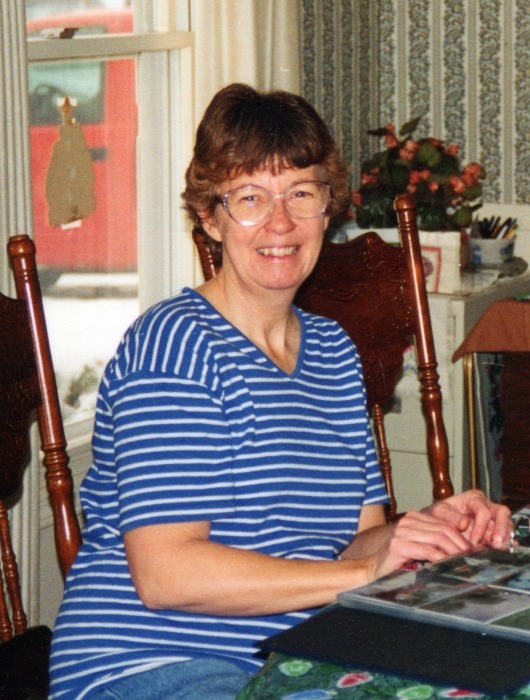 Jeannette Fay Peterson Davis, age 79, formerly of Brodhead, passed away at her home in Mesa, AZ, on June 7, 2018. She patiently endured many health problems starting with a liver transplant, several years of kidney disease, and a fall in March 2018. Jeannette was born June 3, 1939 in Wiota, Wisconsin to Sanford and Mary (Shelton) Peterson. Her mother said she loved to feed the chickens, loved animals and that her childhood nickname was “Little Sunshine,” because she was a smiling, happy child. Her father said she and Evonne liked to climb trees. She also played clarinet in the school band. She worked as a beautician before she married Ray E Davis on September 27, 1959 at the Little Brown Church in the Vale in Nashua, Iowa. They settled in Hinckley, Illinois and Jeannette began her favorite occupation Mother of four and Homemaker. In 1971 the family moved to Mesa, Arizona. As her children grew she worked outside the home at Gilson Uniforms, Walgreens, and American Greetings. In November of 1989 Ray and Jeannette moved to Payson, AZ. In September 1996 she moved back to Wisconsin with Ray and Mike to be by her ailing mother. Ray passed away December 1996, and her mother passed away in 1999. She also worked for a time at Shopko and Swiss Colony in Wisconsin. Her father passed away in 2012 and she returned to Arizona with Mike in July 2013. Jeannette loved to garden and sit in the sunshine. She enjoyed watching football, NASCAR racing, and cooking shows—especially the Pioneer Woman. She is survived by her older sister Evonne (Jerry) Montefelt, Juda, her younger brother Larry (Carmen) Peterson, and her four children: Debora (Randy) Barney, David (Susan) Davis, Dale (Nancy) Davis, and Michael Davis. She is also survived by nine grandchildren: Lisa, Steven, Jaclyn, Elena, Lauren, Laura, Thomas, Diane and Joshua; and four great-grandchildren: Cambria, Aiden, Maverick and Eli. A Memorial Service will be held at 1:30 p.m., Saturday, August 18, 2018, at the D.L. Newcomer Funeral Home, Brodhead, WI. Burial will be in Moores Cemetery, rural Brodhead.